We will prepare the legal documentation required, prior to, during and after your marriage. All couples married in Australia must be at least eighteen years of age unless the following circumstances apply: one of the parties is at least eighteen years of age and the person under eighteen years of age has obtained parents’ authorisation and an order of a judge or magistrate. You are required to complete and lodge the Notice of Intended Marriage (NOIM) form with your celebrant not less than one month, and not more than eighteen months, prior to your wedding date. • Produce an valid Australian or overseas passport or original birth certificate and photo ID (drivers licence). • A divorced person is not permitted to re-marry, unless his or her divorce from the previous marriage has been finalised. The second marriage would be void and penalties may be incurred. 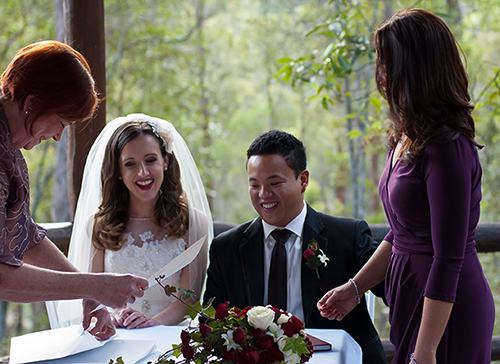 Additionally there must be the appropriate wording spoken by the Celebrant and the couple according to the Marriage Act during the ceremony. It should be noted that the certificate issued by your celebrant or minister of religion on the day of marriage is ceremonial and will not meet the identity requirements of many government agencies (e.g. Queensland Transport, Passport Office) and financial institutions. To change your names on these documents you will need to provide the relevant businesses / departments with the marriage certificate supplied by Births Deaths and Marriages. On the link below there will be the costs and types or certificates you can order. However, as an added service to our couples. you can simply give the completed form with the required ID certified by a JP to us to include with our paperwork that we send to BDM to register your marriage after your wedding ceremony, simply print off the application, fill it in and complete your credit card details and sign. You can find the Marriage Certificate Application and details here.